Barcelona has a hemp museum dedicated to marihuana and cannabis. One suspects that soft drugs are legal in Catalonia since they are not legal in other parts of Spain. That was certainly the reason why bull fighting is illegal in Barcelona. However, there may be a history of drug abuse in Barcelona as Gaudi, Picasso and Dali were probably all users as their depictions of reality are somewhat skewed. Whilst accepting that Picasso was versatile and talented, I gave the museum a miss. It may be simply a lack of education, but I find his pictures childish and simplistic. Its like looking at a neighbor’s grandchild’s pictures. Buildings are usually solid, rectangular affairs. Gaudi’s creations are anything but. Gaudi’s La Sagrada Familia cathedral seems to have been inspired by stalagmites and stalagtites, and is a kind of melted Gothic creation that is still being constructed. To me it emphasizes the temporal nature of all things, even stone. Casa Batlló is apparently inspired by the sea. The ceramic covered central walls surrounding the glass banister panels of the central staircase seem to glisten. The attics are supported by whalebone-like constructions, and everything seems to ebb and flow. Air-flow is ajusted through gills, and the outside of the building is scaly. Well worth a visit, but not somewhere I’d like to live. 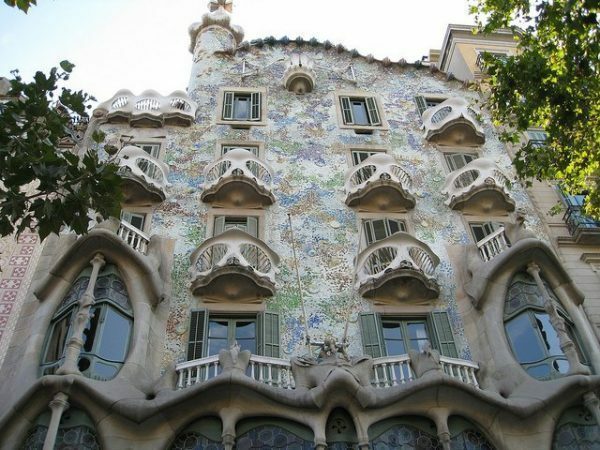 La Pedrera is one of Gaudí’s main residential buildings and is more sculpture than building. The façade is a varied and harmonious mass of undulating stone that, along with its forged iron balconies, explores the irregularities of the natural world. To my mind, this building seems organic. It just flows. I did a day trip to the Dali Theatre-Museum in Figueres. It was Jerusalem Day, celebrating 50 years since the reunification of the Holy City, and, in addition to his better known works, the visit to the Dali museum provided a timely opportunity to view the full Aliyah series of lithographs. Dali had obviously researched the project which included Biblical scenes, Ben Gurion’s declaration of independence, the Holocaust and illegal Jewish immigration. There was meticulous attention to detail, but I think the series had a lack of passion when compared to his depiction of his muse Gala, and I suspect that though he took the commission seriously, he wasn’t personally inspired by the Return to Zion.